There are all sorts of reasons to send videos through email. For a business owner, including a video in email can entice people to click through. Or you might simply have a fun video you want to share with friends or family members that don’t live nearby. In this article, we’ll take a look at best practices for sending videos in business emails, as well as some tricks for sharing videos via email with friends and family. In our latest video trends survey, consumers named video as their favorite type of content to see from brands on social media. And that goes for email too. Consumers like to engage with video. And, if you run a business with an email list, video can be a nice way to boost open rates and click-throughs. But how do you send a video to your customers in an email? The first thing to know is that you won’t be embedding a video so that customers can watch it in the email itself. Although HTML5 embedding is possible, many email clients still don’t support it. And you want to make sure that everyone on your email list has a good experience. For this reason, we recommend simply including a link to the video in a clear and enticing way. How do you do this? Well, in a plain text email, you could simply include a hyperlink out to your video. But we recommend doing it visually, using a hyperlinked image or gif. We’ll look at both those options below. The first option that we’ll take a look at is creating a video thumbnail image in your design. This approach makes it look like there’s a video embedded right in your email. But when viewers click to watch, the video will open and play in a new window. When using this approach, don’t forget to include a play button icon on top of your image. This way viewers will understand that it’s a video and they can click to watch. Just a simple circle with a triangle inside makes all the difference. To really drive home the fact that there’s a video in your email, include a short animated GIF. 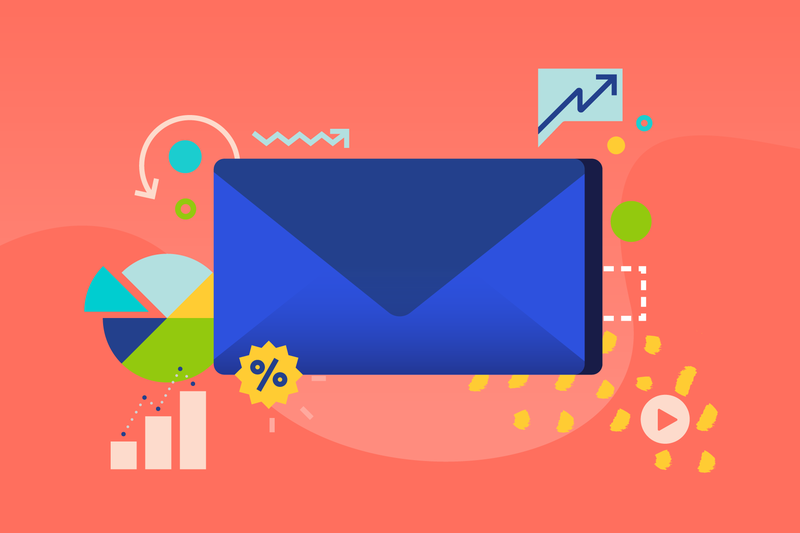 The motion in the GIF will draw the attention of viewers and make the content of your email stands out in crowded inboxes. You can use the tool of your choice to create your animated GIF. If you aren’t sure where to get started, Giphy is an easy option. You can upload a video clip, trim it, and even add captions and stickers. Note: Having large image files can cause your email to load slowly. The email team here at Animoto recommends keeping GIF file sizes under 1MB. If your GIF is too large, try using this free Animated GIF optimizer tool. But wait. If your video isn’t playing directly in your email, where does it live? You’ve got a lot of options. You can link out to a YouTube or Vimeo page, a social media video post, a blog article, a page on your website—anything goes. For your business, it’s ideal to link out to the place that will drive the most results. If you’re using video to sell a product, link to the video on a page where customers can purchase directly. If you want to drive engagement on your Facebook page, link to a Facebook video post. Just make sure the link is public and works on both desktop and mobile devices. If you’re simply looking to share a video over email not for business, you won’t need to put as much thought into the design. Whether it’s a family video, a video of a trip, a recap of a party or event, or a video file you need to share with a coworker, you’ve got a few options. If your video file is small, you may be able to attach it to the email directly. The person you email the video to should be able to download the attachment and view it. However, if you’re doing this, there are a few things to consider. Even if you are able to send large files with your email client, the recipient may have limitations on the size of files they’re receiving. For this reason, you may want to try a different option for any video files larger than 10 MB. You’ll also need to consider the type of file you are sending. Different file types may or may not work on different devices. Viewers on Apple devices may have trouble viewing WMV files and those on Windows devices may have trouble with Quicktime. Uploading a video and sharing a link, which we’ll get to next, can help avoid these issues. You can also upload your video to YouTube, Vimeo, or another video hosting site, or share it on social media, and email out a link. If you do this, be sure you’ve got the privacy settings set up so the person on the receiving end will be able to view your video. If you don’t want to make the video totally public, some hosting services give you the option to password protect your videos. You can also host them on a password protected blog or website page. Just be sure to include all the details in your email so your recipient is able to log in. Trying to share an Animoto video? Click the email icon on the play page to share your video by email with anyone you’d like. Doing so will open up a form where you can add a message and even indicate a delivery date if you don’t want to share it right away. You can also copy the video link to your clipboard and paste it into your own email. If you need to send the actual video file, rather than a link, then you can also go the route of using a file-sharing service. Dropbox, Google Drive, and WeTransfer are just a few options. You can upload your file and then email a link where your recipient can download the file. Again, just make sure the privacy settings are set up in a way that ensures they’ve got access. What’s your go-to method for sharing video in email? Let us know in the comments below. 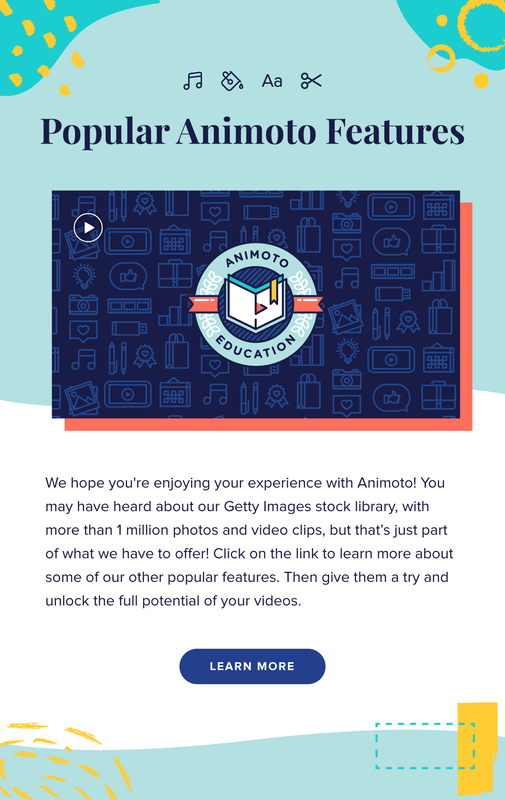 And if you’re looking for a tool to create videos to share in your emails, find out how you can use Animoto to make videos for your business or to showcase your memories.